This is one of my favourite New Year’s traditions! I don’t often know what I want to accomplish each year, right at the beginning. Especially in my personal life. But I do, generally, know the tone I want to set for the year. That’s where choosing a focus word really works well for me. It allows me to start the year with intention and purpose, without having to know all I want to accomplish right at the start. It can be hard to choose just one word to encompass a whole year, some years I choose better than others. I think, that my 2017 word for the year is going to be one of the best ones, for me, yet. Choosing one word for the year is hard for me. I love words! It’s one of the many reasons why I love blogging. Also, I tend to over think things. I’ve found that it is much easier choosing a word for the year if my previous word served me well. Last year, I chose Spunky as my word. I wanted to remind myself not to give up, not be afraid, and to live life on my own terms. I also wanted a word that was a little quirky and fun to remind me not to take things so seriously. In some ways the word fit, in others… not so much. 2016 didn’t feel like a spunky year. My list of words that I brainstormed was long, making it hard to really narrow it down. As seems to be the case most years, rhythm, wasn’t on that list. It popped into my head when I was sitting on the couch mulling over what I want to do this year. Routine building was at the top of my list. We made some major changes to our life in the last half of 2016, and most days I feel as though I’m drowning in my ever growing to-do lists. I’ve spent a lot of time juggling and my arms are getting tired. I dropped a few balls – balls I didn’t mean to drop -and ones I mean to pick back up, but I need to work on building new routines before I can add more to my plate. But you know what? I had routines! I had found my groove with balancing home, work, and family. I was learning to be flexible and accept that sometimes one of those areas would need more of my time than others. That was part of the balance. The problem with a groove is it’s not always permanent. For me, the groove is not sustainable. When I find it, I welcome it, but I know not to depend on it. I thrive on structure and routine. My scatter-brain self needs those two things to feel grounded and balanced. While my creative side needs spontaneity and freedom to pursue a project to its end, even if it means letting other things wait until I’m done. Blending these two opposing forces in my world has been a constant challenge. How does one create routine and structure and still allow for freedom? 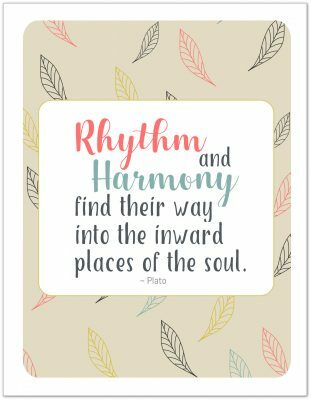 We find our rhythm. That point when a routine becomes part of us. Where it passes the point of habit and is just a thoughtless extension of us. Making coffee in the morning is like that for me. I don’t think, “I need to make the coffee.” I just do it! It’s part of my morning rhythm. It doesn’t depend on a specific time, it’s just a process that starts flowing the minute my feet hit the floor. 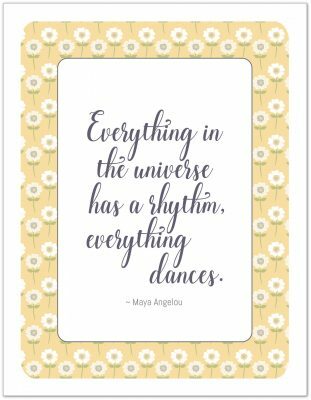 I want to focus more on creating a rhythm to my days, rather than a routine. Once upon a time, laundry was part of the rhythm of my day. Make coffee, load washer. A little later I’d sweep the hall and swap the laundry. I’d get dinner started and fold the laundry. I’d put the laundry away when the kids went to bed. I didn’t think about it, I just did it! Of course, it helped tremendously that the washer and dryer were in the hallway, so there was always that constant visual cue, but it was one thing that just flowed with no real thought on my part. I desperately want to find that again. 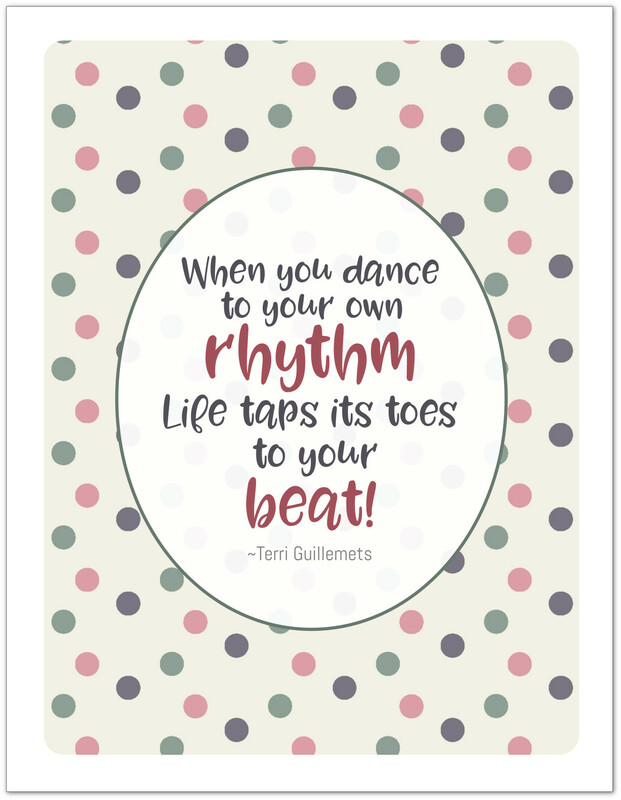 So this year, instead of focusing on building new routines that might be disrupted with life changes, I want to create more rhythm to my life. I want to embrace the natural way I think and do things. 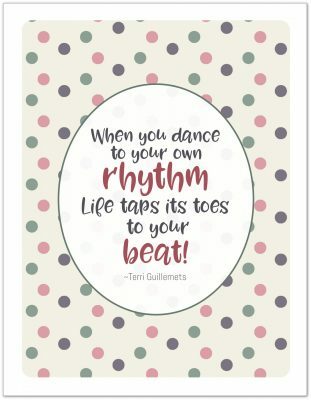 I want to get the family on board with this and see if I can help all of us embrace our own rhythm to how we do the little things that make up everyday living. To help remind me of my word of the year I found some quotes that really spoke to what I’m aiming for. At first, I just wrote them down in my journal and my planner, but I realized I wanted to do something more with them. So I create some journal cards that were fun and eye catching. I plan to use these in all my planners and in various places around the house for the year. I have a lot of ideas about how to make use of them. and anything else I can think up. I really want to approach my word of the year with intention this year. I’m hoping that surrounding myself with little reminders will help keep me more grounded as the year goes on. 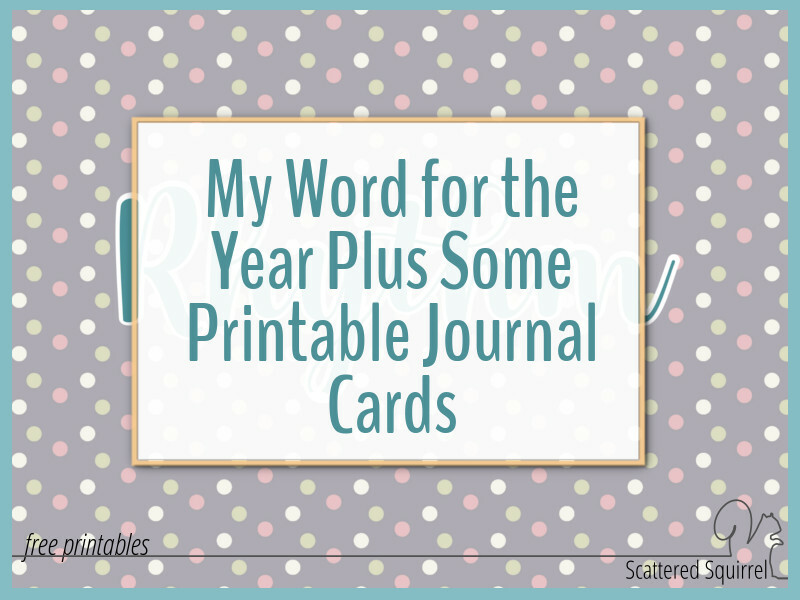 If you’d like a copy of the journal cards (you didn’t think I’d forget to share the printable did you?) just click the picture below to grab a PDF copy for yourself. As always, the printables here on Scattered Squirrel are free for personal use only. If you’d like to use them for something you think might fall into the commercial category send me an email and we can chat! My word of the year is going to serve as a reminder to me, that it’s not about creating a new structure. It’s not about building new routines that depend on where the hands are on the clock, or what day of the week it is. 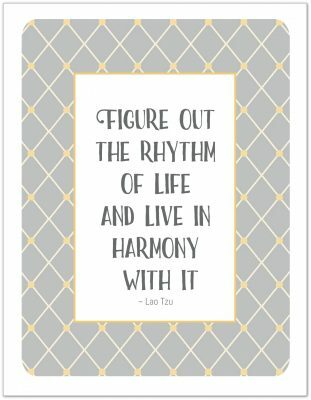 It’s about finding that sustainable rhythm that will make those daily things a little easier to manage. It’s not about getting everything done; it’s about keeping a small amount of momentum going. It is my hope, and my goal, that by focusing more on working things in naturally and less about getting more done, I’ll create a more sustainable addition to my foundation routines. And maybe, just maybe, I’ll have more fun and less stress – more living life instead of managing it. 2017 is going to be the year I fully embrace my scatter-brained approach to everyday living. And I can’t wait to see where it takes me. Do you have a New Year tradition that you love? Do you choose a word for the year? I’d love to hear about them. Drop a line in the comments below if you’d like to share! I wish each and every one of you a happy, amazing, joy-filled new year! Let’s make 2017 the best one yet! That’s a awesome idea. My word for this year is Change. I want to change my relationship with my kids, be more involved with them, change my relationship with God, with my family, friends and more important change the way I see myself. So yes, 2017 will be a year with a lot changes for me. That’s a great word Indira! Aww, thanks Hilda. You’re definitely not alone in that. 🙂 I’m not a big believer in not forcing it. Sometimes you just know, and other times it takes a little bit. 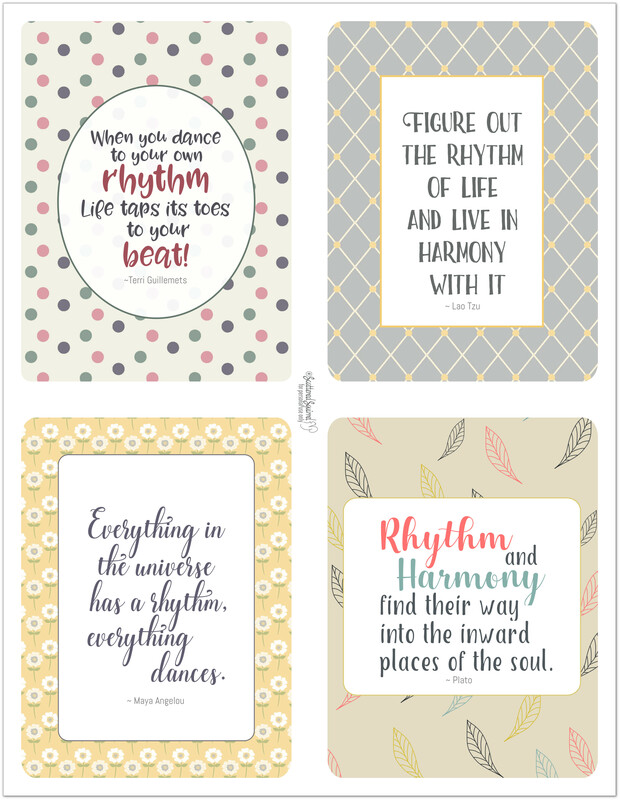 I like that, Rhythm. I think my word for the year is Purge. Purge my home, Purge my old habits by replacing them with new ones. I read in a home magazine the phrase : “Live with what you LOVE, Get RID of the rest!” 2017 HAS to be better than 2016! Purge is very powerful word! I love how you’ve found creative ways to use it to remind you of what you want to gain this year! My word of the year is curiosity. It helps me to keep an open mind and say “yes” more often than I a man general inclined to do. That’s a wonderful word Tanya. I love how you’re using it as a reminder. My word of the year is consistency. I often feel like I gain momentum doing the daily do’s but something derails me and then it takes awhile for me to pick it back up. I want to practice being consistent in my daily do’s, in my business, my health and relationships. That is a fantastic word Sheila. I love you already know how you plan to use it to help you throughout the year. I wish you all the best with your word this year. I think Pause is a very powerful word, especially with the examples you’ve given. It’s so easy to just act and not stop for a moment to think. I love the word of the year that you have chosen. 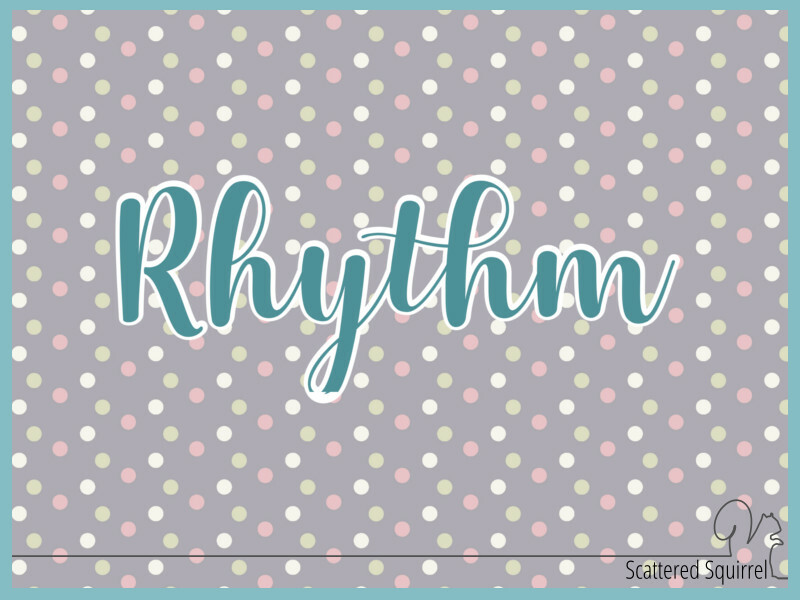 Rhythm sounds like such a magical word. I really like the quotes you have found and are putting to use. Me I’m still thinking on a good word for myself. 🙂 Thanks so much. So far the word is serving me well. When I’m trying to choose a word, I think about all the things I want to do or work on for the year, like habits I want to build or break. That helps give me a jumping off point. Your word will come to you. I have faith! Just discovered your site! Fun! My cousin, my sister-in-law and I have picked out words each year for about a decade. Mine this year is “nourish.” I made a framed graphic as a Christmas gift for my cousin a few years ago of her word of the year. I hadn’t done it since and recently she told me that she had thought we would do the graphic thing each year. I am not sure who this “we” is (ha! ), but I have been working backward through her words and making graphics for her. She plans to hang them in a grid in her office. It has been a fun, reflective project. That sounds like a beautiful tradition to practice together. I love your idea of creating a framed graphic of the word each year. That is such a nice way to remember them.